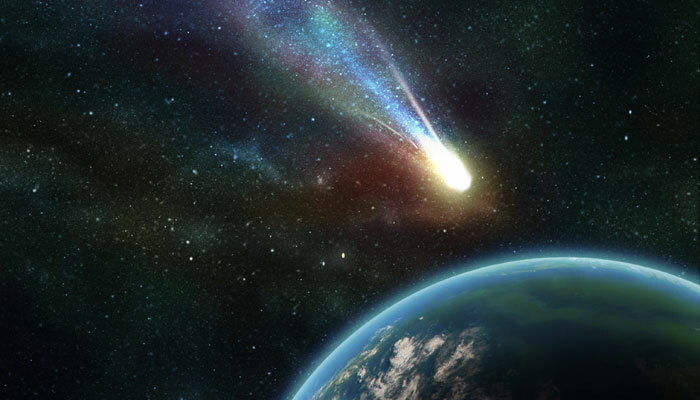 Massive comet strike nearly made humans extinct 13,000 years ago. - Wisdom is the retention of innocence through adversity. Massive comet strike nearly made humans extinct 13,000 years ago. I hope you like this subject because it is one of my favourites. I am not going to stop posting about it, even when we get wiped out by the next cataclysm. I am aware that I am aware that I am repeating myself, offering scant new information. But I want to keep this running, and present several angles on it. Many scientists still don't believe that a comet or host of comets hit the North American Ice Sheet about 10,800 years ago, (12,800 bce). But I have looked at this a lot, and I am convinced that it happened - even if megafauna were dwindling for thousands of years before this punctuating emergency. (Same patterned happened w/ the extinctions around 65 million years ago, etc.) Dust and fire storms followed this event for hundreds of years, and it shows up in the geographical layerings of past organic versus dead/inorganic dust, sand and soil. There were vast floods emanating from the flash-melting ice. An underwater landslide near Northern Europe was probably related to this impact, and/or to the swell of runoff coming down the wide Saint Lawrence Seaway. An area about 50 miles to the north, and 100 miles to the south, of what we know as that seaway today, was swiftly cleared of ice, soon leaving a greening area which was settled by new people. Such a history comports to (flood) legends, history and languages of Native Americans, as I have studied it. (That landslide, btw, is probably what created the Tsunami which left all the bodies buried on the shores of the Hebrides, (etc. ), which have recently been reported. Not certain on this hypothesis). After the impact of this cosmic barrage, the famous Clovis culture was wiped out, along with most of the prehistoric megafauna and other animals. Starkly inhospitable dust and firestorms blew across the plains to the East Coast, while the sea levels rose up and swallowed ancient ports, boats and settlements, obscuring our own ability to study prehistory in subsequent millennia. Sillier things have happened. The amazing and perplexing archaeological site in central/SE Turkey, Göbekli Tepe, also offers evidence of this great, Atlantean event. A great flood, associated with the sky. Interestingly, this site lies in the vicinity of where mythical Noah was said to have parked his ark and opened a hamburger stand. When you think about it, it would be perfectly natural that 40 days/nights of rain might hit the Middle East, following such a disruptive explosion of water, dust and storms. Legends of a great flood persist in most civilisations - we just have a hard time conceptualising that the spoken word could have conveyed something that had happened so long ago - but, by now, I am not at ALL surprised that this may be so! In addition to the vast flood on the NA east coast, (and the N. Atlantic landslide), there was a massive breach unleashing violent floods across what is now the USA Pacific Northwest. However, there is currently a question regarding the dating of this event, and so the word is still out on this (probable) connexion. (On the other hand, I have seen the dust/fire storm evidence with my own eyes). The following article comes from Natural News - a great site for various topics, but it is unfairly biased against liberals in politics. In this regard, it is generally daft as all heck. (Natural News) Ancient people left us a diary carved on stone pillars that talked of a cataclysmic asteroid strike 13,000 years ago that caused an ice age, killed the wooly mammoth, and forced us to modernize farming methods. Reading almost like a comic book, the stone carvings found in Göbekli Tepe were translated by scientists to reveal a series of events that changed civilization forever. Engineers from the University of Edinburgh were studying animal carvings in the Göbekli Tepe in Southern Turkey to see how they related to our constellations. While examining a particular pillar, known as the “Vulture Stone” (also referred to as pillar 43), they found descriptions of what has now been confirmed as a comet impact that occurred around 10,950 B.C. This is around the same time a “mini” ice age started. This mini ice age, called the Younger Dryas, only lasted for a thousand years yet is of particular importance to scientists because of its direct impact on mankind. Evidence suggests that it was during the Younger Dryas that the first Neolithic civilization arose, along with better agricultural methods. An article on Phys.org describes the period’s importance: “The cooling period caused groups of people to band together to cultivate crops, leading to the development of agriculture, which in turn led to huge leaps in technological innovations and societal developments, i.e. Neolithic civilization.” This period has also been linked to the extinction of the wooly mammoth. The Daily Mail article HERE. (Other sources are listed in the NN article). My post: Why won’t this debate about an ancient cold snap die? People fleeing the devastation, clearly disgruntled because they have been turned into elephant-like creatures. I think Noah had a winery rather than a hamburger stand. Is there any demographic evidence for this near extinction? But seriously, there is no knowing whether that threatened extinction - I think the writer was just pulling the regular sensationalism that paranormal sites always do. But, to look for suggestions of a major threat, then consider the loss of the megafauna, the Clovis, the probable mass death in tsunamis - and any possible sudden migrations of people into newly depopulated lands. Something big happened with the beginning of the younger dryas. This is when our species turned to agriculture. Such a major change suggests a major threat occurred somehow. But I think a tighter bottleneck happened around 74,000 bce w/ the Tuva eruption.